Let's discuss great ideas for the kids, parties, etc that are Paleo and candy free, but still good fun for the kids. I also use this approach although for food sensitivity/allergy issues I'm going to have to take a lot of it away from them before they begin the sugar fest. A dentist in my neighborhood growing up gave out toothbrushes every year, and we all started avoiding his house. Maybe if word gets around that you only give out raisins and toothbrushes, you'll get a lot fewer trick-or-treaters to worry about next year! Target? Seriously? I am soooo looking for those! have you seen the minis? I found boxes of them at Target. We barely get any Trick Or Treaters so you just gave me a great option. thanks! 5 a day? I ate half a pillowcase in two days. Sorta. My mom helped, but she was "helping" 3 kids. "...other than maybe setting up bad habits." Um...this seems like a pretty big deal to me. Most adults I know are still dealing with the negative habits they developed as children, in one way or another. If a child eats junk food but then does not feel well afterward and wishes to not go back then that is HUUGE! This allows for a better chance that they actually do not request junk food in the future. They are learning from experience instead of just taking your word for it! handing out little travel toothbrushes!? hilarious. i love it. Insatiable and efficient ...love it. This accurately describes me as a kid, too. Lol!! My Halloween candy always lasted well past Easter - and I ate some every day. We knew which houses gave the best stuff and planned accordingly. People used to give a much wider variety of stuff back then - fruit, money, cans of soda, popcorn balls, homemade stuff like cookies/brownies - not just standard bag candy. I agree it has to come from them. I took mine to McDonalds the other week the they not only could not finish the food and drink but said that it did not make them feel good and they don't want to go back !!! This is not a bad idea for low-volume neighborhoods. I'm thinking presidential dollar coins for the kids and wooden nickels for the teenagers that come around late. 100 to 200 grams!!!! You obviously have NO IDEA how much candy I was able to haul in each year as a kid. On holloween night, I had to go back to my house several times just to unload the weight of the candy and then I would go back out again to collect more. We plotted our routes accordingly. Afterwards, we had trading parties to trade ones we didn't like for ones we did like. And I ate like 5 candy bars a day for months. If it were only a few candy bars, I would not worry. What I worry about is kids that are like I was, ie both insatiable and very efficient! Yea, a party with your kids' friends - or just enjoying with family - is the intended backdrop for the chili/soup, pumpkin seeds, and apples. Now that I think about it you're probably on to something. Likely not worth the risk of setting off a theretofore undiscovered allergy! But...by that same idea, when would one ever serve nuts to guests? I agree I'm not keeping my kids from enjoying the holiday and part of it is candy. They live 99% of the year eating like saints so on easter/xmas/halloween I let them have at it. I think they learned a good lesson last year when they pigged out and then laid around feeling sick. As is the case with most things you can't just tell them "candy isn't healthy" they need to experience it. Anecdotally, I had Capt Von Trapp type parents that never let up on me in regards to sweets, alcohol, smoking, friends etc and when I hit 16 I rebeled so hard they nearly disowned me (and nearly went to juvie). havent kept up on the adult onset celiac to be honest. I suppose i did post a bit bodyweight-centric there. Def didnt mean to use that as the only rubric. I suppose i didnt express that we all keep very paleo in the house 90% of the time so i was kind of viewing halloween in light of that was all. It's too much of a downer, IMO to be restrictive on the holidays as far as the kids are concerned -- instead of making them feel like they are "missing out," I let them have it and see that they're not missing much in the first place. And seriously, if you are careful with the day-to-day sugar intake, the kids don't seem to go crazy with the stuff when they do have access to it. Ha - I can imagine the looks on kids' faces if I managed to track down single-square packs of Lindt 99% dark. Single-serve packs of trail mix, if you can find'em. (Consider Amazon or Sam's Club/Costco for this...). Have a couple of alternatives if kids with allergies show up. Chili (as mentioned by Deidre) or pumpkin soup. If you do paleo baking, you could make some coconut bread or muffins to go with. Card games! A good game of poker could be enjoyed by older kids (tweens and up). Offer to trade poker chips for candy at the start before the cards are even dealt. Offer to "buy" your kids' candy at a nickel or a dime (or whatever) per piece. 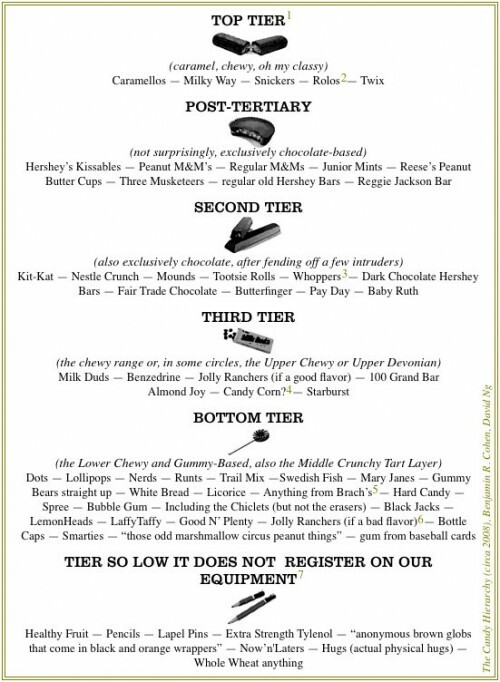 Edit to add: I saw this Candy Hierarchy on The World's Best Ever and realized that my above suggestions may put me squarely in the bottom tier... :) Shares a category with white bread, but at least "whole wheat anything" is a tier below trail mix. Im with Angelo! Seriously guys, if your kid is paleo then one day of the year eating ~100-200g of sugar is literally nothing. It doesn't even register on the health radar other than maybe setting up bad habits. For those that don't want to keep their candy or have some left over you can get rid of it through the 'Halloween Candy Buy Back' program. Dentists nationwide "buy-back" Halloween candy from children in their communities and then send the candy to U.S. Military deployed in combat through Operation Gratitude or other Military support groups. I'm in a perfect dilemma over Halloween. The kids want to trick or treat, they have their costumes all ready to go. But how do I let them pollute their little bodies? I used to love the occasional candy myself so I don't know what will be decided. Good thread, i think theres a lot of us here with little ones. I have always thought that kids (im talking 3 year old but) are pretty resilient generally. Tess sometimes eats some bagel, rice and beans, birthday cake etc and shows no signs of chub or unhealthiness. I always chalk it up to simple growing child-thing, yknow? The body is in such a state of growth that it can deal with some less-than-ideal stuff whereas homeostasis-oriented adults like all of us might have to be more thoughtful with our choices. So, with that in mind i see some reeses peanut butter cups sneaking in once/year as not too big a deal. I came up with that junk and it didnt hurt me too bad i dont think. That being said, i'd love some good ideas from maybe bakers, more experienced homemakes, etc. Mix all and drop from round scoop - roll in something of your choice: coconut, seeds, nuts, dark choc chips. My kids take these for lunch. You can also add Whey Protein powder instead of the flax or cocoa for extra protein (depending on how paleo strict you are) I like the MRM Natural Brand that IHERB Sells. I don't agree with the idea of being too limiting in what you hand-out to other people's kids. Halloween is supposed to be fun! And other kids can be really mean about making fun of your children if your family has a reputation for handing out lame treats on Halloween! When I was a kid, the guy who handed out nickles seemed kind of cool. So did the families that handed out play-doh and bubbles. But the apples, raisins and toothbrushes seemed lame, and those kids really did get picked on. Last year I settled on a quality candy with some redeeming nutritional value and let it go at (okay, very little redeeming nutritional value :->). I think it's very important to let our children experience fun and important social traditions. We don't want them to feel so weird or so unable to relate to their peers experiences because we deny our kids those experiences that our kids rebel against the health values we are trying to instill. They are just kids. And yes, our culture has terrible food habits, but it is part of the culture our kids are growing up in and learning to navigate. My mom used to hand out bottles of water, juice boxes and bags of popcorn. In our neighborhood the kids were actually grateful for the water/juice because we'd go trick or treating for hours and hours. I saw a suggestions somewhere to hand out peanuts in the shell (letting the kids grab a handful). However, for safety reasons I wouldn't let my kids eat anything that wasn't pre-packaged (even though now I'm suspicious about the health of any pre-packaged food). Right now I'm leaning toward single-serving trail mix packs. Or maybe I'll just hand out unadulterated razor blades ;-). One year we gave out mini raisin boxes. I've heard of others giving out tooth brushes. My mom would send each kid off with some candy and a hearty "Happy cavities!" As for kids, some friends of ours used to let them eat all the candy they wanted to the evening they collected it and trashed it all the next morning. Since they did that since they were small it wasn't a big deal... until they were teenagers! LOL! We're one of those neighborhoods that sees maybe 4-5 kids maximum each year, so my dad always gave out "uncommon" denominations of money. First it was 50 cent pieces, he even did $2 bills last year - I'm surprised word didn't get around on that one! Personally, I'd probably do very small bags of trail mix or nuts (usually the ones I've seen are pretty large/~500 calories). As a kid I personally hated dark chocolate (Hershey's Special Dark was the bitterest I could take). I think I'd let my kids do their trick or treat thing but tell them they could only keep, say 10 pieces of candy of their choice. The rest will get donated to... something. Where can you donate candies? Some kind of charity event maybe. Have them sell the candy for charity would be a nice touch. At one of my social clubs, we have candy and bags of nuts out and members pay 50 cents for them and the money goes to run the club. After Holloween, the club usually gets a big candy donation from the leftovers. Or the kids can sell it for profit for themselves! I would go with dark chocolate or chocolate covered peanuts for giving out to other kids. Have that plus the option of some small cute toys to tempt the younger kids. For younger kids, things with lots of colors and sparkles will tempt them. I remember when I was four, I loved to get chiclets just because of all the beautiful colors, even though I didn't like gum that much. You don't want to give out homemade food items as that might freak out many parents if they don't know you. And I can safely say, when I was a kid, I and my friends would not have wanted any of that chili or homemade things and my parents would not have let me eat it anyway. If you give out things the kids don't like or can't have, then it's just a waste of money and time because the items will end up in the trashcan and the kids will be disappointed. LOL, a few years ago as a newlywed without kids (when I knew everything about kids...), I bought good candy (top tier) and bags of pretzles. Fat kids got pretzles. Normal sized kids got good stuff like chocolate. I thought I was so awful and funny!! From a paleo-viewpoint I was trying to kill all sizes of kids, but from a SAD point, LOL, I was a big meanie!!! Ha Ha Ha!